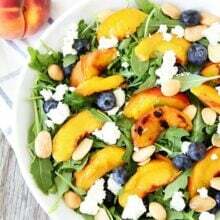 Grilled Peach, Blueberry, and Goat Cheese Arugula Salad-the grilled peaches make this gorgeous summer salad extra special! Oh, summer I am loving you and your fine produce! I can’t get enough. I am currently obsessed with grilled peaches. I make Josh grill up ripe and juicy peaches almost every day. 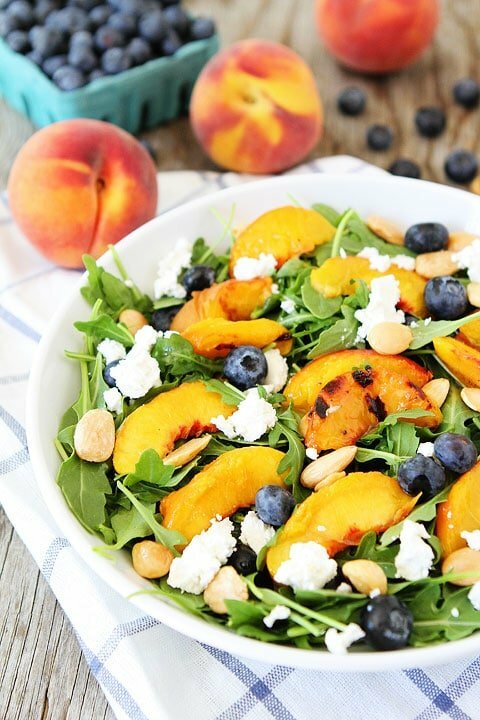 I love eating them plain, with Greek yogurt, and in this Grilled Peach, Blueberry, and Goat Cheese Arugula Salad. 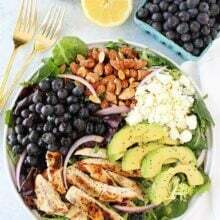 This salad has been my “go to” lunch this week. 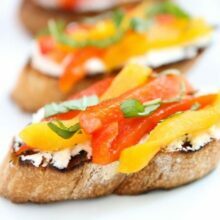 Not only is it beautiful, but it is fresh, tasty, and easy to make! You should add it to your summer menu ASAP! This salad is great for an easy lunch or dinner. I also like to make it for summer BBQ’s and parties. Everyone always compliments on how pretty it is and after they taste it, they for sure want the recipe! It’s a winner all-around! The grilled peaches are the star of the salad. I brush them with a little bit of the dressing and have Josh grill them until they are soft, sweet, juicy, and lined with grilled marks. I let them cool to room temperature and slice them so they are ready for my salad! To make the salad, I start with a bed of arugula and then add grilled peaches, blueberries, crumbled goat cheese, and Marcona almonds. If you can’t find Marcona almonds, feel free to use regular almonds or your favorite nut. Pecans would also be good! The dressing is light and simple to whisk up. It just gives the salad a splash of sweetness and flavor! 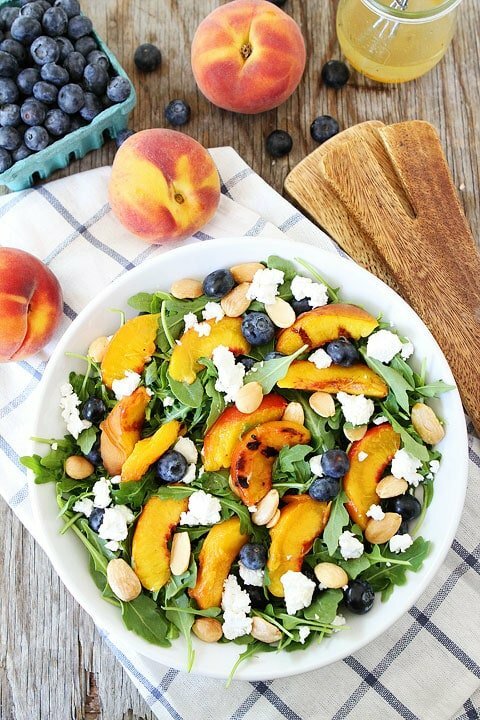 Take advantage of summer’s finest produce and make this Grilled Peach, Blueberry, and Goat Cheese Arugula Salad. Arugula salad with grilled peaches, blueberries, goat cheese, Marcona almonds, and a light honey dressing. 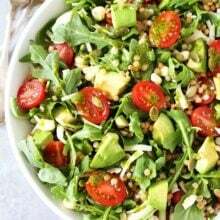 This beautiful salad is the perfect summer salad! First, make the dressing. In a small bowl or jar, whisk together olive oil, vinegar, honey, salt, and pepper. Lightly brush the peach halves with the dressing. Preheat the grill to high heat. Place peaches, cut side down, on the hot grill. Grill for about five minutes, or until the peaches are soft and have grill marks. Remove peaches from the grill, cool to room temperature, and slice. 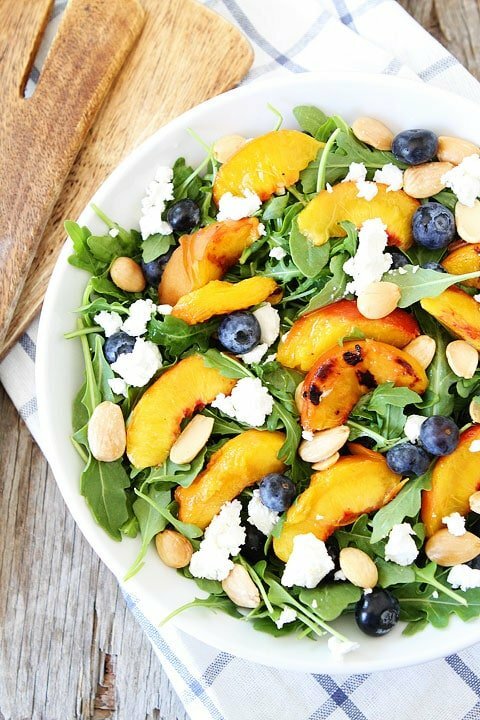 Place arugula, sliced grilled peaches, blueberries, almonds, and fresh goat cheese in a large salad bowl. Drizzle with salad dressing. Gently toss and serve immediately. and loving all those gorgeous colors! Pinning 😀 Happy weekend! I don’t need to tell you how beautiful and nutritious this vegetarian salad is, we all already know that! The way you craftily fit in arugula, whoop whoop. But I get all weird about goat cheese. NEVER HAVE HAD IT> only have eaten cheese from cows, kind of like eating deer, freaks me out. But maybe I should give it a try. Love the grilled peaches! Great idea. You don’t know what you are missing without feta or ‘goat cheese! We also love venison, the meat is leaner and healthier than beef. This salad looks so good! 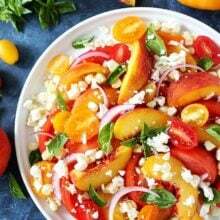 I have a ton of peaches right now, so this would be a great salad to use them for! This salad has all of my favorites. Arugula and goat cheese with grilled peaches…it doesn’t get much better. Thanks, Maria. Gorgeous photos. Love all of these flavors! Perfect summer salad! Love grilled fruit and this salad sounds great! This salad is PERFECT! I love everything about it and must make it this weekend! we’ve been obsessed with peaches in our salads lately, and I keep meaning to grill them…..this looks incredible! Love this colorful summer salad! That is one gorgeous looking salad!!! I love all the fruit and nuts on it. And those grilled peaches are amazing!!!! 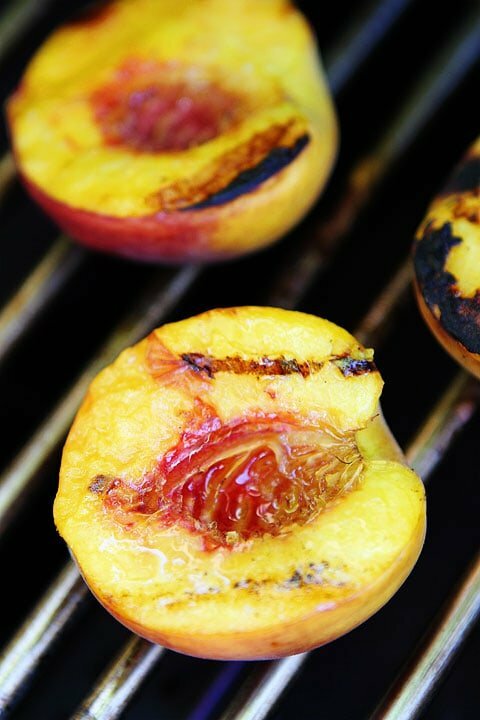 Can’t get enough of grilled fruit and this looks like a must-try recipe! What if I don’t have white or golden balsamic vinegar and want to make it tonight?!? Love the grilled peaches! Great summer salad! We had this salad last night and it was delicious and SO easy. Definitely a keeper. We (over in Britanny,France) just had a wonderfull barbecue with this salad and the southwest pasta salad. Delicious! Our mexican friend loved it and even the frenchs liked it! Amazing combination of flavor. Can we replace peaches with apricots? They have more fiber, vitamin A and C and also potassium. What do you think about this idea? I made this salad last night, and it was delicious. I changed a few things up based on what I had on hand. I didn’t have any white balsamic, so I used the palest I had – apricot flavored balsamic. I used smoked almonds and herb goat cheese because I had them. I also sprinkled on some sliced green onions that needed using. I loved this salad, and my wife (who’s not an arugula fan) loved it too. Score! Thanks for the great recipe. Looks amazing! Made it with a slight variation. Instead of almonds I candied some walnuts with maple syrup and cinnamon. Nom nom!!!! This was delicious! As someone who’s half-Italian, I always think I should like arugula more than I actually do. The sweetness of the fruit and honey balances the peppery bitterness of the arugula perfectly. Thank you so much! All these recipes look great and very tasty yet lack the nutritional values. I have found this for most of the offerings on Lose It. We can only guess or work it ourselves just how healthy the food is. Personally I’d rather someone tell me to save my effort! Pingback: July 24th – 29th – Dinner's on! Did add almonds but what a treat!